Why do these 3rd graders look so happy? Because they helped create this stunning quilt! Artist-in-residence Ellen Oppenheimer and dozens of Peralta students have put many hours into this unique work of art, which will be raffled off at the Peralta in Bloom Festival on May 12. 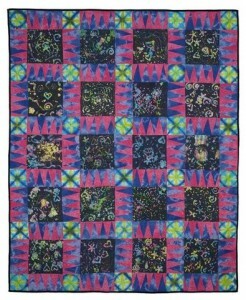 Quilts are a Peralta tradition, and the raffle is our oldest fundraiser, now in its 15th year. Peralta quilts have been displayed around the world, including at the American embassey in Moscow, and featured in an exhibit at the San Francisco Airport. Now it's time for you to start selling tickets! Together, we can raise thousands of dollars for Peralta's art and enrichment programs. Check your child's backpack for a green information sheet and 30 raffle tickets for your family to sell. Olders students may be able to sell tickets themselves—younger students will need a little help. At $1 each or 6 tickets for $5, they are easy to sell to friends, neighbors, family and co-workers. If you need more tickets, please see Sonia in the library. Tickets and stubs are due back to the library by Friday, May 11. The drawing will be May 12 at Peralta in Bloom. If you aren't able to sell your tickets, please return them to the library so someone else can sell them. We have some kids who are champion ticket sellers, and like to sell hundreds of tickets. Questions? Contact Laura Counts at laura DOT counts AT gmail DOT com.